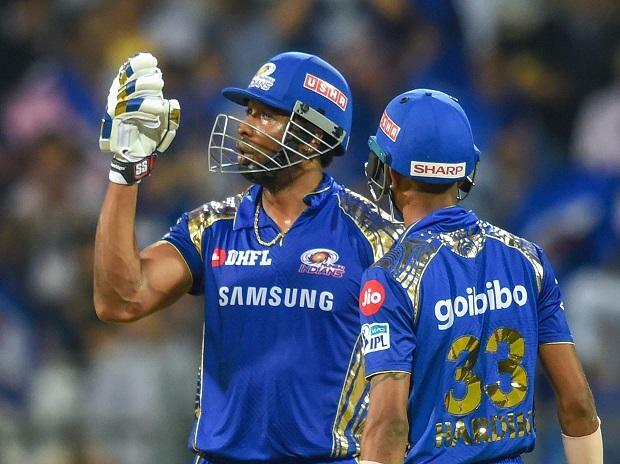 Pollard, who led the team in place of the injured Rohit Sharma, smashed 10 towering sixes and three fours in his 31-ball innings to take MI to the doorsteps of victory. Once he departed early in the last over, it was Alzarri Joseph (15 not out), who took MI home, chasing down Kings XI's target of 198 off the last ball. "You can say yes, you can say no (whether it was his best knock ever). It's more important that we won the game. I stayed calm under pressure. I wanted to finish off the game. Keeping that calm head in the end was good," Pollard said at the post-match press conference. "The guys rallied really well. That's why it's a team sport," the 31-year-old Trinidadian complimented his team mates. "We got a start, 50-1 in power play at ten runs (actually a shade over 8) an over. We knew what we had to do. Well done boys. It was a very good batting track, brilliant (track)," said Pollard, who promoted himself to number four from his usual no 6 or 7 spot. Chasing 198 to win could be tricky and Pollard said the idea was to break it down and target two Kings XI bowlers. Punjab bowlers, barring Mohammed Shami (3 for 21), went for plenty of runs as Pollard sent them to the cleaners. "When I saw we needed 104 off 48, I knew we had to break it down. We got two big overs. We had a couple of bowlers whom we had to target and we did that and got the much needed two points chasing down 198," he said matter-of-factly. Earlier in the day, another West Indian Chris Gayle had lit up the Wankhede Stadium with a power-packed 63 off 36 balls, hitting seven massive sixes and three fours. He put on 116 for the first wicket with K L Rahul, who carried his bat through to remain unbeaten on 100 off 64 balls, studded with six sixes and as many fours. Pollard did not see it as a one-on-one battle with Gayle. "For us it's not a battle, it's about enjoying what we had to do. Rahul batted very well too, hit some glamorous shots. He has come into form as well. When your mind is free you go out and enjoy your cricket," were his parting words.